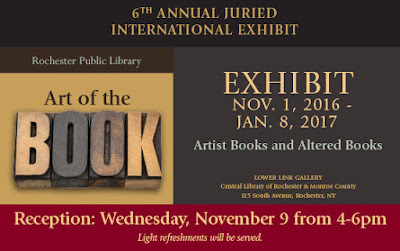 So the "Art of the Book" exhibit is happening at the Central Library of Rochester & Monroe County, in Rochester, NY. They accepted a couple of my books for the show. Ongoing til Jan 8th if you're in that area. A copy of the program is available online. Looks like I'm in some very good company in this exhibit. Congratulations Rhonda! Will the exhibition be travelling at all? As far as I know, they don't intend to travel with this exhibit. Wood cover and back. Can you help?